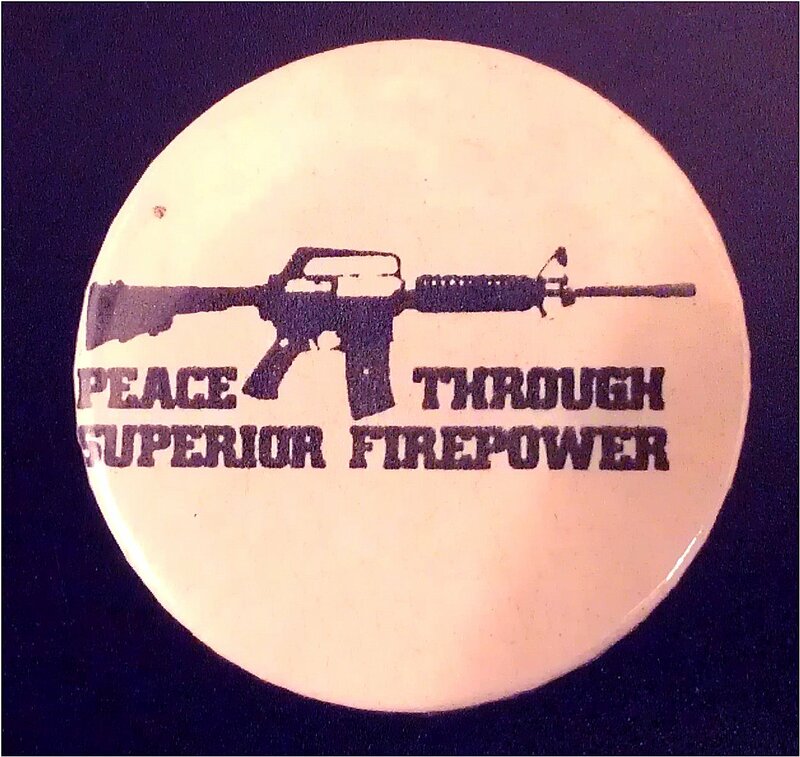 Three and more decades ago, when the Libertarian Alliance kept “The Alternative Bookshop” in Covent Garden, we used to print badges that said useful things to people: rather as if we were Marxists-Turned-Upside-Down – in the words of one of my very perceptive and incisive University chums. I call this badge to mind [I have kept in the Main Lower Library’s Archive Of Objects an example of all the best ones we made] in view of the events of Thursday et-seq. If the Liberal Capitalist West was properly at “Defence-Stations” – and it is not – then it is quite inconceivable that the Russian dictatorship-Junta would even dare to contemplate thinking even privately of destabilizing Ukraine to chew off bits of it – let alone (worse) inveigling traitorous Marxist-sympathisers within Ukraine to do so as its catspaws. Incidentally we also wouldn’t have more than a light regional but nugatory difficulty with “Islam”: which it is believed is a sort of mysogynistic pre-capitalist desert-survival-guide, but which most of its tacit adherents resignedly accept the Fatwa that it is a “Religion”. For the individual human costs of trying to “leave” it, as prescribed in its Book, don’t bear thinking about. A major and exact historical parallel, in the same continent, is in front of our noses. In 1938 as you all know, this is when the Third Reich privately egged on the Sudeten-“Germans” under the fascistleftoid Nazi Conrad Henlein, in their efforts to dismember Czechosolvakia. In that instance a major reason was the intended confiscation of Europe’s third largest military organisation, plus the hijacking of Czech and Slovak heavy industry like the Skoda armaments-complex. The Czechoslovak Army alone fielded 43 divisions in that year, not counting its armour-capability. Eastern Ukraine, as you all know, contains the major part of that country’s industrial and coal mining areas. I leave you all to draw your own conclusions. In the meantime, as War Secretary, I’ll ensure that all Anglosphere Nations that wish to “travel with us on the Rad Map For Peace” – the proper one, not the US Democratic Party one – at the very least, are armed to the teeth, without any sort of restriction. I’ll also be tearing up the Ottawa Treaty and denouncing it on behalf of the UK, for which I will have defence responsibility. It will be my decision, taken in the UK’s best interests. It’s no other nation’s damn business whether we choose to deploy “airfield denial weapons” or not, for example. Thanks for this David. I had been quite offended by Sean’s weasel words on the subject. Chris: Sean and I as officers on the LA’s Bridge, disagree sometimes – even about strategic libertarian policy, if indeed there is such a thing – but we are always agreed that it shall be “never in front of the Sailors”. Then we allow each other to say what we say, provided that it doesn’t get the LA or us into trouble with the Gestapo. For example, I don’t entirely share Sean’s insistence that Tony Blair be strung up from a lamp-post after a War Crimes Trial, although I would go for the trial which would be plenty bad enough for is foul wife and spoilt children as it would stand. What weasel words? I always make myself clear. I don’t think Sean actually uttered in his post on the subject. any “weasel words”, whatever those might be. Apologies, I missed the context of that when I was replying as the phone rang and it was the beighbours about something. I was indicating that while I might not sometimes agree totally with what he says – he can say what he likes. It’s our bolg after all! Er, well, Chris, I’ve just read Sean’s piece again, and I can’t seem to find where he was being mealy-mouthed about anything, if that’s what you meant. Well Mr Blair and Dr Gabb do not always disagree – for example they both utterly misunderstand what sort of person Mr Putin is, and think he can be worked with (he can not – and not because he is a Marxist, which he is not). It is a good post David – it reminds us all that the M16 has usually been on the right side in conflicts (as has the FN FAL) and the AK47 has usually been on the wrong side. A rather basic truth that this site – with its visits by article writers of the down-with-big-business down-with-the-rich school of thought tends to forget. On the specific point about the Ukraine….. The pro E.U. social democrat types in Kiev are hardly my cup of tea (to put the matter mildly – very mildly), but they are better than the mixture of vicious drunken criminals and deluded Marxists that Mr Putin has been arming (and sending in fighters to back) in eastern Ukraine. As for the Americans arming the Kiev government – apart from the practical problems (American weapons need training to use – for example giving a AK47 to a random thug will work, give him an M16 and he will jam it) there is also the Obama problem. With hide sight too little work was done on the financial corruption of Comrade Barack and Comrade Michelle in the Chicago days. Some dissenting Marxists (the Marxist movement in Chicago is split into factions) insisted that both Comrade Barack and Comrade Michelle were more interested in corruptly looting money for themselves than in “The Cause” – however most (although not all) people looking into the Obamas from the other side (including me) were obsessed with their political background and looked at their potential criminality as an after thought (it at all). For this neglect we are guilty. A lot of hard evidence of criminality against Comrade Barack and Comrade Michelle (the sort of stuff that could send them to prison) would be useful. Not just in relation to the Ukraine – but in all sorts of matters, foreign and domestic. “But that is blackmail” – blackmail is a traditional tactic in such matters. Even morally it can be the lesser-evil. Although I am still wary of getting involved in the Ukraine – not just the Crimea (which is lost – although no Ukrainian politician is going to admit it) but in the Ukraine in general. It does seem to be a place where the other side has the advantage. Unless the people that Mr Putin has employed drink too much – odd as he is a sober man (although a vicious criminal) himself. The unstable coalition of various social democrat type parties has fallen again in the Ukraine. People with long (ish) memories will remember that this has happened before. At least the puppets of Moscow are united – the alternative is (and always has been) like a “herd” of cats (try herding cats).